During her 2003 deployment with the U.S. Army in Iraq, Sgt. Yvette Pino [BFA ’11] was known, as she puts it, as “the soldier running around the desert with a paint bucket.” She was the unofficial “Division Artist,” a title she earned painting blast barriers, army vehicle doors and helipads. After receiving a bachelor’s in fine arts from UW-Madison in 2011, Pino launched Veteran Print Project to encourage dialogue among veterans, artists and the general public. Now the printmaker is curating and coordinating In Good Company: An Exposition of Emerging Veteran Artists, a citywide showcase for veteran artists. More than 20 artists will be showcasing works at 11 venues throughout the city during November; this Veteran’s Day, Nov. 11, is the 100th anniversary of the signing of the Armistice that ended World War I. Among the venues hosting veterans’ art events are Arts + Literature Laboratory, Edgewood College, Overture Center for the Arts, Commonwealth Gallery and the Wisconsin Veterans Museum. 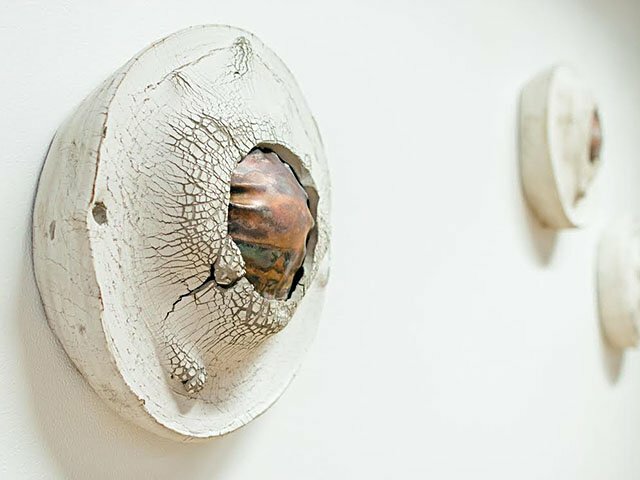 One exhibit, at Gallery Marzen on Atwood Avenue, features work from Josh Zeis, a former Army medic and ceramic artist from Fargo, North Dakota. Zeis’ sculptures are made of disabled IEDs nestled into cracked clay.